I love minis, and normally I enjoy doing in-depth reviews of the latest minis set with many pictures. This time is different for two reasons: 1) This is a set I found to be disappointing. 2) I have a major project and my time is limited. My Miniatures page has a minis tracking spreadsheet, updated for the latest set. I also update my trade sheet so you can trade minis with me! I called the last set “perhaps the best WizKids D&D miniatures set to date!” This set is the opposite. I find the quality and even the overall set design to be one of the weakest in a long time. There are some amazing exceptions, fortunately. However, because of how the set is created, I find it really hard to recommend this set for collectors or for new DMs (or new players). 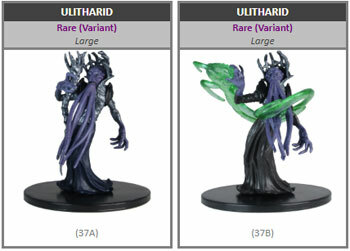 The only exception is a DM that is running Storm King’s Thunder (yes, the previous storyline adventure) and needs even more giant minis than the ones found in the Storm King Thunder minis. This is a set to avoid, or maybe to buy a few select minis online. Monster Menagerie III consists of 60 unique miniatures (plus 6 ultra-rares), sold in booster boxes of 4 randomized minis. You can purchase a “brick” of 8 booster boxes, or a “case” of 4 bricks (32 boosters). The booster’s $15.99 list makes it a relatively good purchase at your FLGS and I always like to support my FLGS when I can. You save a few bucks on Amazon. However, case purchasers should look into sites such as Miniature Market, which has a case for $370, bricks for $95, and boosters for $12.50. The case incentive can be purchased for $60 or your FLGS may have a copy. The set consists of 16 Common, 27 Uncommon, 17 Rare, and 6 Ultra-Rare minis. Compared to the last set: -3 C, +2 U, +5 R (but, wait! ), and -4 UR. On the surface, not a big change, though I like last set better… again, on the surface. However, let’s did deeper, because they added… Rare Variants! That one sets you back around $20. Infuriating! The set also has common and uncommon variants, but in those cases you end up with plenty of each, as with previous sets. The set list is extremely disappointing. 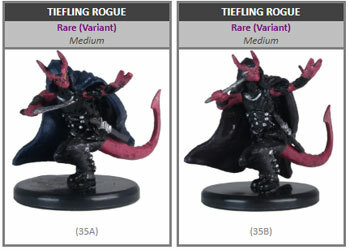 In the past, a “Monster Menagerie” has been one of two things: cool selection of random monsters, or a stealth set to secretly provide us with minis we needed for an upcoming adventure (as with the first Monster Menagerie, which provided minis for the Curse of Strahd adventure). Here we get two themes: Storm King’s Thunder and Volo’s Guide to Monsters. Unfortunately this fails as a set. Each box includes one Huge monster. We had a few sets in previous years that had a large in every box, or even a huge in every box, but that worked because the variety still met any DM’s needs. Here, every single huge monster is a giant. Every single one. If you aren’t running Storm King, that’s way too many giants… especially if you own the actual Storm King’s Thunder set of minis! The giants are also from Volo’s, which while adding diversity also limits appeal. I really don’t want three “Mouth of Grolantor” hill giants eating pumpkins. I don’t think anyone does! When it rocks: If you are buying just a box or two, this might be an advantage. Every box has a huge giant. Want a huge giant? Not a bad price point. Just hope you don’t get a pumpkin giant! The more you buy, the more the set loses value. There are a few really fantastic rare giants, such as the Storm Giant Quintessent and the Storm Giant. The Goblin Hucker is just awesome too. Poor Variety: Beyond the giants, the variety is still lacking. The set is all over the place, but not in a cool way. There are a few useful additions (magma and mud mephits, death dog, gray slaad) and a few very awesome ones (quadrone, gibbering mouther), but the sculpts are seldom comparable in quality to old DDM sets. Quality: As before, there are painting issues (poor paint jobs, over-painting that robs detail on a mini, but another of the same sculpt is done better) and the plastic is brittle. I had one broken giant. You can get a replacement, but you have to pay for shipping and send off your mini… not worth it, just disappointing to have to glue your mini. Even sorting my minis, I broke a really nice older giant, just putting a new one on top! I reviewed the Kraken case incentive last time. It is superb and well worth the $60 price. Please, please, please always provide a full set of rares with every case! It’s the whole point of making that big investment in a case! Otherwise, there is no reason to do so! The plastic continues to be too brittle and too thin. Miniatures look too spindly and at times look cheap. Huge minis are cool, but you overdosed us on one type, especially when we had giants so recently. When you provide that many huge minis, storage becomes a major problem. Huge minis should be really cool and useful to validate all that space we need for them! Paint job quality continues to be erratic. When it’s bad, it’s really bad. The monsters chosen for this set did not work particularly well neither for new or experienced DMs. Previous sets have done a much better job of being useful and exciting across the set. Many of the Rare minis did not feel special, neither in what they were nor in the quality of the mini. The paint job on Nameless One is utterly atrocious! There are a few really fantastic minis. The Quadrone, Storm Giant, Storm Giant Quintessent, and Goblin Hucker were really amazing! The Kraken case incentive is amazing!!! More like this, please!!! Naming: We have too many minis with the same name both within and across sets, and this will only get worse. Including the weapon of a variant, such as “Orc (Axe)” and “Orc (Sword)” would be great, or a return to the DDM descriptor style of “Ogre Ravager” and “Ogre Pulverizer.” Different names really help collectors and are a great help when trying to buy singles online…especially when variants are involved. You can track your collection or look up all of the minis in the DnD Miniature Collection Tracker I maintain. You can also trade minis with me by downloading my trade list! The Origins and Gen Con conventions both release their event catalogs! I will be attending Origins this year. Origins has a downloadable file here. D&D fans should check out the full event descriptions and grid on the Baldman Games web site. This year I get to play the D&D Open, since I am not part of the writing team! The description sounds really cool! A heist! I’m also playing some Pelgrane Press and maybe some Numenera or Dungeon World. We’ll see how lucky our group gets with events. Gen Con updated its Event Finder, and you can always use the High Programmer listings. If you missed it, I was on the official D&D Dragon Talk podcast! This was so much fun! Finally, I completed the Dwarven Forge project, creating adventures for the recent Kickstarter. This was an incredible project and I have such admiration for the Dwarven Forge team! They had amazing creativity and were superb to work with. This entry was posted on April 26, 2018 by Alphastream and tagged Miniatures.